Dionysius II (Dionysius the Younger), Dionysius’s I (Dionysius the Elder) son, succeeded him in (367 BC) and who had for a long time had clashes with his uncle Dione, and whom he defeated and in 357 BC, exiling him together with his brother Ipparino. The Callippo tyrants followed (354 BC), who killed Dione, then Ipparino (353 BC), killed by the populous, and who was succeeded by his brother Niseo (351 BC), then exiled by Dionysius II. The tug-of-war for power ended in 347 BC, when Timoleonte arrived from the motherland City of Corinth, and who after having conquered the City, initiated a programme of urban town-planning and political reform by destroying the fortress and proclaiming a democracy based on an Athenian role model. After twenty years of oligarchical governing (336-316 BC) conducted by Sosistrato, Agatocle came to power and waged war on the Carthaginians, but was defeated in the first Battle of Imera (311 BC), and then on African ground, after having tried to take Carthage. On his death (289 BC), a period of anarchy and civil struggles followed, culminating in an attack by the Carthaginians. The citizens then called for help from Pirro, King of Epiro (278 BC) and brother-in-law to Agatocle, who resisted in the City until the ascension of Ierone II, his commander. Initially adverse to the Romans, it changed politics and became an ally of Rome, in this way guaranteeing 50 years of peace in Syracuse. From 240 BC, he wanted his son Gelone II to rule by his side, but he died shortly before he did. During his reign of Syracuse, many monuments were embellished, amongst which the Ara of Lerone, an immense altar used for public sacrifice. In 216 BC, Geronimo, son of Gelone II, came to power. He was responsible for the alliance with the Romans and therefore the successive siege and fall of the City by the hand of the Consul Marco Claudio Marcello. The City courageously defended itself, also by utilising the famous mirrors of Archimedes, who was killed by a Roman soldier. 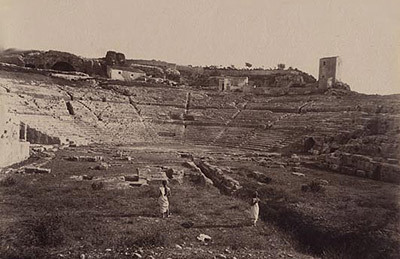 Syracuse then lost its importance and was stripped of all its works of art at the hands of Verre.